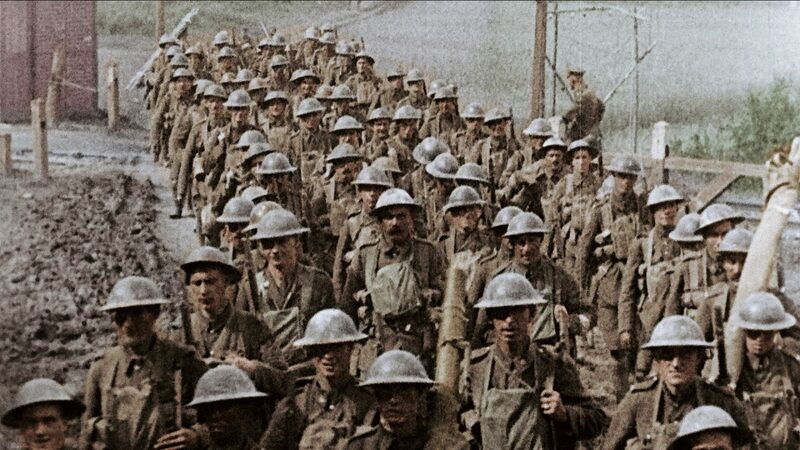 Three original NFB films about World War I are being screened at the Canadian War Museum in Ottawa through to March 31, 2019. Featured in the exhibition Victory 1918, these works were compiled using rare archival footage, immersing museum-goers in the last 100 days of the war. In the run-up to Remembrance Day, we spoke with producer René Chénier and director Philippe Baylaucq about this latest partnership between the NFB and the museum. November 11, 2018, marks the 100th anniversary of the end of World War I. 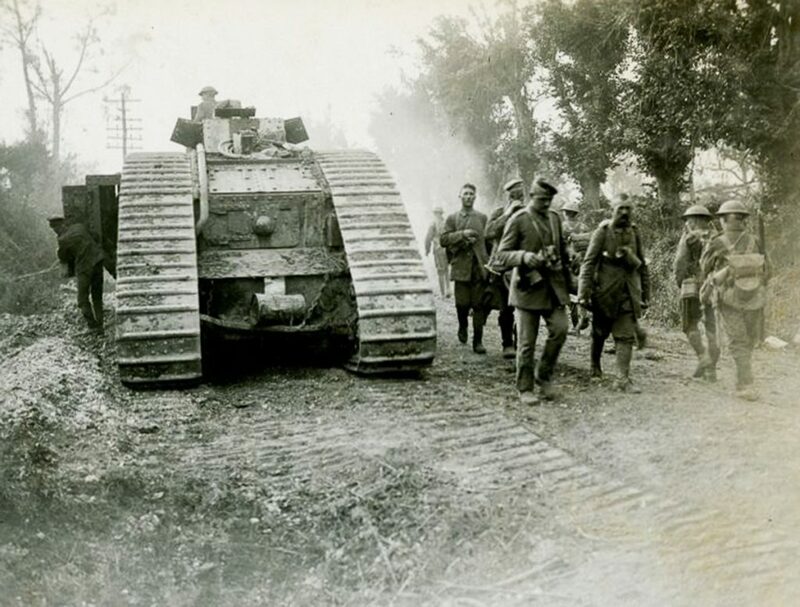 The Canadian Corps played a major role in the conflict, especially in its final phase, called the Hundred Days Offensive (August 8 to November 11, 1918). The Canadian War Museum called upon the NFB, whose collection contains archival footage from this period, to help it honour the event. Filmmaker Philippe Baylaucq quickly took to the idea of revisiting certain episodes of the conflict. Which is how, in just three months, the short films The Tanks of Amiens and Currie’s Dilemma, as well as the immersive installation Mons, the Last Day, came to be. What was initially intended to be a fairly straightforward video project was transformed by the duo of Baylaucq and Chénier, known for creating immersive works such as Kyma (for the Montreal Planetarium) and A Day on the Franchère Bridge (for the Pointe-à-Callière Museum). Though the archival footage may have been used in different ways, the common thread between the three films is that they were created specifically for the Canadian War Museum, rather than a traditional movie theatre. “When René and I work together, we apply the art of filmmaking to the needs of an exhibition. It makes for quite a rich creative environment, for which you need to take into account the exhibition space, staging, any tactile elements or objects, and the project’s tour route,” explains the director. So while the museum initially requested that Mons, the Last Day be a traditional film shown on a single small screen, Baylaucq and Chénier embarked on a journey to create a huge immersive work that could be shown on four screens. For The Tanks of Amiens, the main focus of the project—recreating one side of a tank using cardboard—evolved into a two-minute film illustrating what these vehicles were like in action on the battlefield. “It was very particular work; I was using archival footage and documents—so there was this documentary foundation—to create fiction,” notes Baylaucq, explaining that many of the museum’s historians and staff also took part in designing these works to ensure their accuracy. The goal of the third project, the short film Currie’s Dilemma, posed another significant challenge: How to dramatize the mindset of a Canadian general wrestling with the decision to commit his troops to a dangerous but vital strategy? 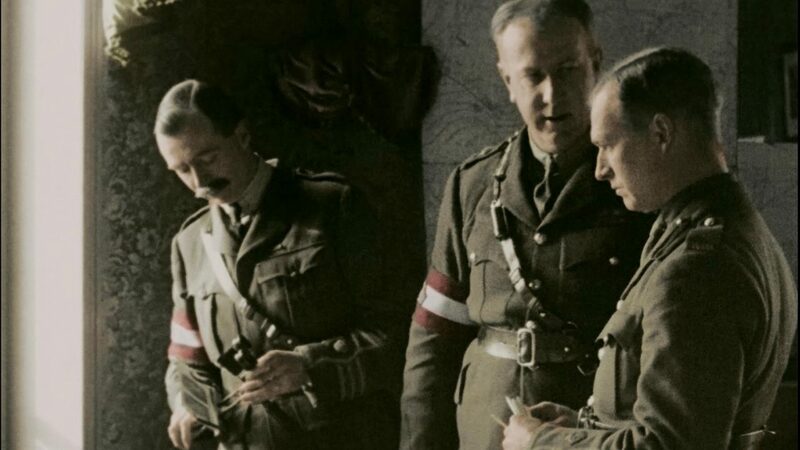 Baylaucq didn’t have the budget to shoot a fictional film, nor the time to create an animated one, but he did have access to some rare archival footage—a short black-and-white silent film that showed General Currie in an office with his officers. This excerpt, shot in 1918, was completely transformed. First, the museum wanted it colourized. “Colourizing archival footage is a complex and costly process. It takes a lot of work to get the skin tones right, for example. But we’re very happy with the end result,” explains Chénier. Sound was also added to the silent footage. Based on advice from historians and dubbing experts, Baylaucq literally made his characters speak, imagining what they might say, and hiring actors to deliver the lines. Sound designer Sylvain Bellemare then created a realistic soundscape from scratch. Because there were jump cuts throughout the sequence, Baylaucq shot his own B-roll, faithfully recreating the period décor, and intercut it with the archival footage. He also created a new scene that captures the general’s solitude after meeting with his officers. The culmination of this immense effort, Currie’s Dilemma, is a fascinating hybrid film edited to integrate images from both past and present. In honour of Remembrance Day, watch 4 films and one 13-part series that delve into the experience of war and the lives of soldiers. Discover Rose’s Notebook. This historical series follows Rose Dubois, a young French Canadian archivist. She describes her daily life and her thoughts as First World War is unfolding. Discover Rose’s Notebook. This historical series follows Rose Dubois, a young French Canadian archivist. She describes her daily life and her thoughts as World War I is unfolding.